I have tried my best not reveal as much magic of the film here as I strongly believe you should watch this film and travel with it to feel it's magic. The film was very well edited in the sense that as you watch the film it brings you to flashback and there is couple of scenes which moves front and back in the timeline, but due to excellent editing, it was so easy on the eye to watch and follow. I loved the whole theme of "Unproposed 1st Love" because I believe it is something that nearly everyone who will watch Venpa, would have had such experience in their life and that makes it all the more easier to connect with Venpa on an emotional and intellect level. Kavi, your dialogues were a highlight for the film too. It was so meaningful yet so light to be understood. My particular favorite was the part where Thenavan says he LOVED Kalyani. I think we all were expecting him to say I Love You, but saying he LOVED her carried so much more meaning to the film and added a lot of value to it. Yuvaraj a.k.a Thenavan is the second factor to the success of Venpa. The boy has immense talent and this is just a pinch of his capabilities. The character of Thenavan is not an easy character to play as he has certain turmoils happening in his mind as he meeting Kalyani. He needs to suppress the internal conflict enough to show Kalyani he is calm and collected but express it just enough to let the audience know there is something running in his mind, That is no easy task and he executed it very well. On a note of improvement, the scene which he teared didn't really convince me it was a genuine tear and that is something he can work on future films. The future is bright for this lad. women and a lady of few words. At all points of the film she is shown to be someone who is not drawn to Thenavan. Given a chance she would have avoided him completely but due to the circumstances she had to speak to him. Her individual smiling shots was absolutely beautiful and it was a huge treat to those watching her on the big screen. I primarily enjoyed her scene right after the flashback whereby there is a huge emotional change on her face towards Thenavan. Another character who deserves to be mentioned here is Santeini who played the role of Shiela. She is without a doubt my favorite character of the film. I think he character was so beautiful crafted and design by the director yet so underplayed due to the short length of the film. If the film were to develop into a full feature film length, I would love to see more of her character on the screen as I find her so mature and intellectual. 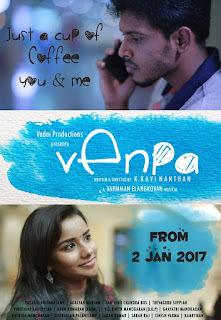 In fact if you watch the film closely, you will notice that it is because of Sheila that makes the whole ball rolling for Venpa. Lastly not to forget Thevaguru Suppiah who plays the role of Satya Bang. This character will remind you of your actual high school senior or university senior. Someone who you speak of with so much of respect, someone who you wouldn't mind doing anything for because they mean alot to you. The role he played reminded me of my Segi University seniors. When I first heard the song from Venpa, it did not create any magic in me. I felt the song was Ok, nice to listen but I wasn't "wow" by it. To me it was average at best. 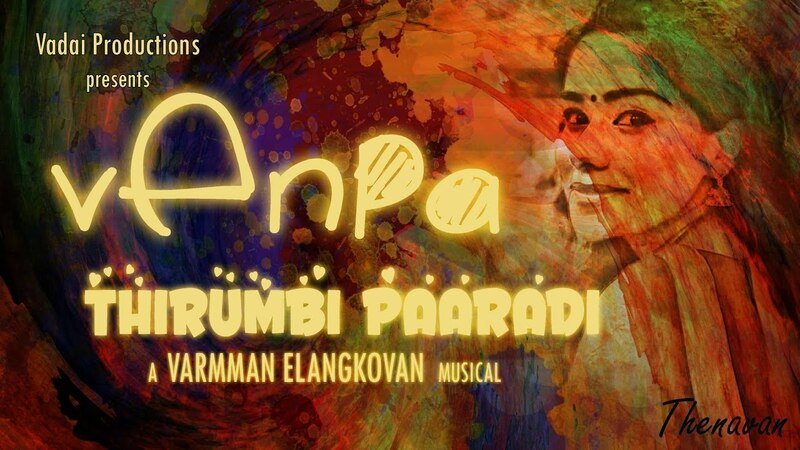 But when I saw the screening of the film, the music in the 3rd big factor is making Venpa a success. Hearing the song with the visuals and the timing was simply amazing. The background music at parts of the film were so well placed and so beautiful tuned. It was MAGICAL. To express an emotion well to the audience, the performance of the cast alone is not enough. You need a beautiful bgm to help it reach to the audience and Venpa had that magic. That is why I truly believe Venpa will be a huge success among it's audience.